Ca. 500 to 800 AD. 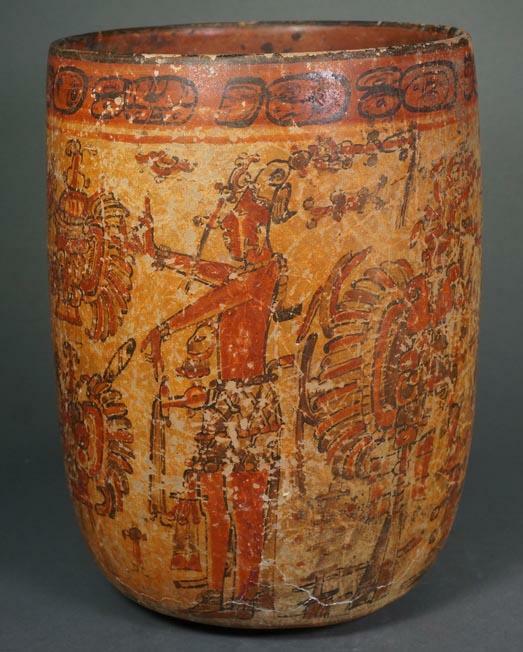 A deep cylindrical vessel with complex iconography and a hieroglyphic inscription under the rim. The two standing idealized young lords are similar but not identical. They represent the Maize God. Isolated floating motifs which fill the void are common in Maya art and are present here. There are detached long-mouthed deity faces in front of the young lords which may be parts of their costumes or headdresses. The sets of three lines at the bottoms may represent stands or tripods for the masks. Size: 7-1/2 inches Height. 5 1/4 inches diameter. Provenance: Ex Miura Hiroshi, Old Japanese collection.